To share the fun, I thought it would be an awesome idea to write a blog post all about naturally dyed Easter eggs. Easter is coming up, after all! I always get eggs from my local farmers market, and they tend to be brown. This doesn't mean they can't be dyed though! In fact, brown eggs can create some really interesting colors paired with plant dyes. All the photos you see throughout this post were made with brown eggs. I find using brown eggs tends to produce richer, darker colors, but they're beautiful nonetheless. I really encourage you to support locally harvested eggs whenever possible. Most of the white chicken eggs you find at the grocery store come from factory farms where the hens are treated terribly and crammed into tiny little cages. Supporting locally sourced eggs means happier hens and fresher eggs! As an added bonus, I got all the ingredients for this DIY relatively plastic-free. Most of the supplies can be found at your local farmers market, grocery store or bulk food store. You might even have some ingredients in your home right now. Are you ready to make some naturally dyed Easter eggs? I know I certainly am. Here's how to use plants and spices to dye eggs, waste free. Note: The most waste free option is to use what you already have on hand. Already have vinegar, but it's in a plastic container? Use it up anyway. That being said, if you don't have something on this list, try to buy it as waste free as possible. I always opt for glass, metal or paper packaging whenever I cannot get something completely package free. Note: I found almost all these ingredients at the farmers market. The red cabbage I got package free from the grocery store. The turmeric I got in my own container at the bulk food store. These are the colors I decided to make, and the plants I used to make them. You can choose to only make one color and experiment with how long you let the eggs sit in the dye to create different shades, or make all the colors and have them sit in the dye the same amount of time (which is what I did). First, you'll want to hard boil all your eggs. Simply add them to a medium pot and cover them with cold water. Bring the water to a boil and then turn off the heat and cover the pot. Let it sit for 10 minutes like this, then place the eggs in a bowl of cold water until they're cool to the touch. Bring the dye matter and water to a boil. We had 4 pots going at once! Turn the heat down to low and simmer, covered, for 15 to 60 minutes until you get your desired color. The longer you boil the ingredients, the stronger the dye will be. Remove the egg dye from heat and let it cool to room temperature. Pour the dye through a mesh strainer and funnel it into your mason jars or bowls. Add 1 tablespoon of vinegar for each cup of dye liquid. Now you can add the hard boiled eggs to the dye. I lowered them down into the dye using a spoon - some jars I fit just one egg in, others two. Place them in the fridge until the desired color is reached. I let them sit in the dye all day and overnight, thus producing some intense, rich colors. You can check on them periodically throughout the day to see how they're coming along. When the eggs are ready, you can scoop them out with a spoon and place them on a drying rack, a plate, or an upside down egg carton. They typically have a matte finish, so if you'd like to add a little shine, feel free to rub the eggs with a drop or two of olive or coconut oil. I didn't, but it's totally up to you. After that, be sure to refrigerate the eggs in a bowl until you're ready to eat them! The whites inside them will probably be dyed too, which makes opening them up even more exciting. Enjoy! My mom and I let the eggs sit in the dye all day and overnight. This was the result! Totally worth it. The blue almost looks black here, but it was really a dark navy blue. We love doing this together. It's definitely our favorite zero waste Easter tradition and honestly a great bonding experience. You can do it with friends, kids, or even your significant other. It's just that fun. I will admit that this DIY does require a lot of water, and there will certainly be cooked food leftover. Don't waste it though! You can save the cooked beets and shredded cabbage to add to your meals over the course of the week. Also, for some ideas on how to use up the plant dyed water, here's how to reduce water waste. As for the onion peels and egg shells, make sure they get composted! You can even use the onion peel water as vegetable broth in your next soup, so don't throw it away. Ultimately, naturally dyed Easter eggs are definitely the way to go. It may be more work than using the traditional food dyes or egg kits, but it's a lot less wasteful and doesn't contribute to water pollution (which, mind you, fake dyes do). Conventional food dyes have even been linked to affecting behavior in children, so why would you want that in your body? Need a quicker option to make naturally dyed Easter eggs? For those who are strapped for time, and don't feel like boiling a bunch of plant matter, I'm happy to say there is a quicker (but still natural) fix. I recommend Eco-Eggs: Their kit is made with natural and organic fruit, plant and vegetable extracts. It also includes a grass growing kit on which you can display your finished eggs. Totally beats that fake plastic grass any day! Just make sure to order it soon so it arrives on time. Would you give these naturally dyed Easter eggs a try? 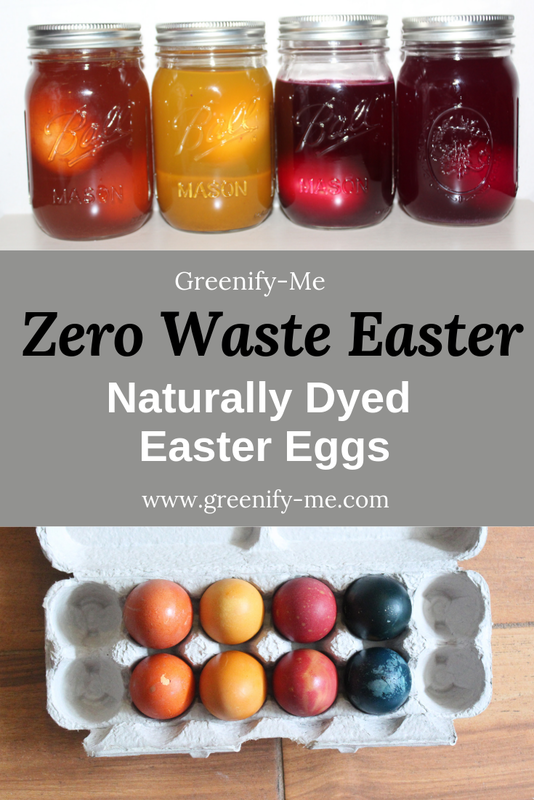 For more zero waste holiday tips, check out my post all about how to have a zero waste Easter.